An engineering officer, Gordon was an evangelical Christian, born in Woolwich, London, whose sincere belief that he was the agent of God's purpose made him a fitting opponent for the similarly inspired Mahdi. Gordon's force of personality and willpower first showed itself in China when he courageously led the Manchu "Ever Victorious Army" against the Taipings. By 1864, he had transformed a peasant guerilla force into a well-disciplined army, and achieved stunning against-the-odds victories. He returned to Britain in 1865 a popular hero. 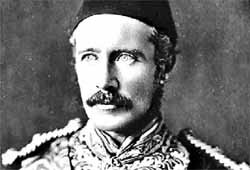 The 1870s saw Gordon begin his association with Egypt -- first as Governor of Equatoria, and then, in 1877, as Governor-General of the Sudan. He was a tireless fighter against the slave trade, and was a just and humane ruler until ill health forced his retirement in 1880. By then, he was widely perceived as the ideal Christian warrior, a suitable hero for a nation that saw itself as an agent for the redemption of mankind. However, the Mahdist revolution in the Sudan had reached such a pass by 1884 that a press campaign forced Gladstone to place Gordon in charge of the evacuation of Khartoum. Gordon had other ideas, and ensconced himself in the city, refusing to leave the Sudanese to Mahdism. The pleas of an isolated and embattled idealist aroused the nation's conscience. Here was a gallant Christian defender of civilization who placed duty before political expediency. After 10 months under siege, time and supplies were running out for Gordon. A relief force under Sir Garnet Wolseley was ordered down the Nile by an exasperated Gladstone in August 1884, but the British soldiers needed to be acclimatized, and the army moved slowly across the desert. An advance force in river gunboats reached Khartoum on January 28, 1885, two days after the city had fallen. Gordon was killed as the Mahdi's forces swarmed through Khartoum. The truth, as far as it is known, is that he died fighting down several Dervishes with his revolver before being shot himself. His Queen and countrymen preferred the image later immortalized by Hollywood, of the martyr facing death calmly for the cause of humanity.